The Lord has blessed Nephi with knowledge of His goodness and mysteries. God reveals Himself to Lehi in visions and the writings of a book, from which Lehi learns marvelous things of His goodness and mercy, as well as some of God’s plans for his people. Lehi is filled with the Spirit of the Lord, and his soul rejoices as his heart is filled. He also learns that Jesus will descend from heaven, and will be the Messiah. Nephi intends to show in his writings the tender mercies of the Lord, and His power of deliverance. therefore I make a record of my proceedings in my days. This very first verse in the Book of Mormon is generally rightly considered an introduction to the person Nephi as well as to the Book of Nephi. But it is much more than that. The crux of the verse is Nephi’s declaration that he has been “highly favored of the Lord.” What does he mean by that? He mentions having been born of “goodly parents,” which looks like a favor. But in the context of the verse it is not; it is simply an explanation of why he was educated. Good parents provide an education for their children (a foundational concept for Latter-day Saints and all civilizations). Nephi is merely expressing a cause-and-effect relationship: I was born of goodly parents THEREFORE I was taught. We may feel intuitively and wistfully that the absence of negatives – strife, problems, adversity – constitute favor of the Lord. But again, Nephi rules this out, saying he himself has seen many afflictions in his days. In fact, Nephi’s identification of the Lord’s blessing is that he has known much of the goodness and mysteries of God. The favor is knowledge – knowledge of a particular kind and intensity and value. With or without a nurturing family life, with or without problems or travails, the Lord can give this knowledge, which is a great blessing and favor, and which one can obtain from no other source than God. Nephi continues with another therefore: THEREFORE I make a record. In his mind, writing his life experiences is as much a logical consequence of knowing God’s goodness and mysteries as having a good education is the result of having good parents. It also brings the verse full circle, so that we understand the significance of his claim to having been taught. The ultimate purpose of the education was so that he could write this record. He doesn’t claim to have written the record because he had an interesting life (though he had), or because he was a co-founder of a new civilization (though he was), but simply because he knew of the goodness and mysteries of God. He doesn’t even claim to know all the mysteries of God: Later in the story the Spirit asks him, “Knowest thou the condescension of God?” and in his answer, Nephi says, “I do not know the meaning of all things, nevertheless. . .” this is what I do know. We do not need to be trans-oceanic travelers, or adventurers, or explorers or rich and famous. We do not need to be great scriptorians, or to believe that we are successfully and completely living according to the teachings of Jesus Christ. In whatever situation God has placed us, in whatever circles we have chosen and created, if we know of the goodness and mysteries of God, it behooves us to write our own story. After Nephi’s introduction to himself, his family, and the situation in his country, he writes in verse 5 of the first prayer mentioned in the Book of Mormon. His father Lehi, by listening to Jeremiah and other prophets God had sent, recognized the serious situation in his nation, and prayed for them. This was not a prayer for himself or his family, but a sincere, heartfelt prayer for a wicked people, his friends and neighbors, whom he loved. Lehi loved his people, but, as subsequent events unfold, they return his love by hatred, ridicule, and violence. 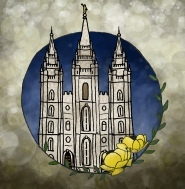 It contrasts with when Mormon prayed on behalf of his people, but without faith. Was Lehi naïve about the state of the people? Do Laman’s and Lemuel’s protestations of the people being righteous reflect their family’s belief before Lehi’s prayer and visions? In your prayers, follow the counsel of Jesus and the example of Lehi, and pray in behalf of wicked people – either your country or individuals, even while you believe in the justice of God and in agency and choice. he did quake and tremble exceedingly. The answer to Lehi’s prayer came immediately in the form of a vision. We might consider it a First Vision experience – much more than he expected, and the beginning of a total change in his life - a life-long calling as a prophet. This being a second-hand account, we do not have the details of all that the vision entailed. Nephi says he “saw and heard much.” Precisely what the answer to his prayer was is not as important to us as the fact that it came. Although not using the word “therefore,” it is as much a cause-and-effect as in verse 1 (I have good parents – I was well-educated; I know the goodness of God – I write. He prayed – he got an answer.). This section is actually our introduction to God in the Book of Mormon. We learn of Him that He’s responsive to prayers. Lehi prayed for something specific, and received his answer. As you pray, be specific, then notice the answer the Lord send you, and write it. being overcome with the Spirit and the things which he had seen. The Book of Mormon teaches that the Spirit accompanied Lehi’s vision. Being overcome by the Spirit made Lehi weak. Was this to protect him from returning too quickly away from the vision, to enable the vision to sink into his heart? As you read the scriptures, invite the Spirit to be with you and teach you. Then when you finish reading, spend a little time pondering what you have read and learned, before you get up and go about your day. in the attitude of singing and praising their God. After Lehi’s prayer in behalf of his people, the first mention of prayer recorded in the Book of Mormon, he received a vision right on the spot where he was praying in the wilderness. Later that day, after he returned home, another vision was opened up to him. Lehi had prayed in faith to an unseen God. That unseen God answered the prayer, and revealed himself to Lehi, who now sees with his own eyes the God of heaven in his glory. This is one of those very rare theophanies where Got the Father appears to a prophet, as He later did to Joseph Smith. As you pray, imagine yourself in that company of happy angels praising God. What do you have to praise Him for? Tell Him! and he beheld that his luster was above that of the sun at noon-day. At the very beginning of the Book of Mormon record Lehi and Nephi have introduced us to God the Father. Now they introduce Jesus, though not by name or title. He is only called “One descending out of the midst of heaven.” He was one of those praising God, living in that place of light and peace and joy. Consider the events of Jesus’s life, the treatment He received after he willingly descended. Consider that even on earth, though not physically visible to humanity, he retained his luster. He did not change course from His behavior and focus in the premortal realm – He continued to praise and glorify God in all that He did. Imagine yourself descending from heaven as well (which you did). You may even have been part of the numberless concourses of angels who praised God in that place. What can you do today to retain that identity? The Book of Mormon, like the Bible, stresses the importance of the Twelve who followed Jesus. and their brightness did exceed that of the stars in the firmament. We are assured that we recognize Jesus in this Book of Mormon vision because He has “twelve others following him” from heaven. The Twelve are a dim reflection of those numberless concourses of angels surrounding God in heaven. The original Twelve testified of the Christ, organized His Church, reflected His light, and wrote holy words which became scriptures. Twelve follow Jesus today, performing the same functions. Appreciate the light from the current Twelve apostles. Read their words and work with them in building God’s kingdom in these latter days. and bade him that he should read. Jesus Christ is specifically identified as the one who gives Lehi the book, or who continues the revelatory process begun in the wilderness. The Twelve are specifically described as “going down,” implying their previous existence in the heavenly realm. We, too, have received books from Jesus Christ, including both the Bible and the Book of Mormon, and He bids us read them. As you read the scriptures, think about that! The Book of Mormon teaches that reading scriptures brings the Spirit of the Lord. Before you read, invite the Spirit to be with you. God shows Lehi that Jerusalem is going to be destroyed. This is exactly what Lehi had been hoping to avoid when he first prayed, but now Lehi knows, as did Jeremiah and the other prophets, that it will come to pass. What’s interesting about this account is that Lehi is not saddened, depressed, or discouraged by this news. Obviously God has shown him much more and helped him see the situation from His own point of view, though Nephi does not really discuss this. While we do not know all that Lehi learned from his visions, we know how he responded. He himself joined in praising God. He first praises God, because he personally knows how God lives surrounded by proper praise and worship, but He doesn’t confine himself to His pleasant surroundings. Lehi says God extends His grace to all the inhabitants of the earth. When Lehi praises Him for being merciful to those who come to Him, Lehi is expressing hope for the people he originally prayed for – his fellow countrymen. Although the city will be destroyed, he has hope that some can come unto God and be saved. The whole Book of Mormon is a testament that God’s mercy truly is over all the earth, and He is again inviting all to come unto Him and not perish. yea, which the Lord had shown unto him. This is obviously a second-hand account, because Nephi really hasn’t shown us anything to rejoice over, as Lehi rejoices in what God has shown him. Nephi told us the nitty-gritty destruction plan, because it’s the story that’s happening as the Book of Mormon commences. But it seems that when God gives a vision of destruction, He accompanies it with understanding of His ways, which are praiseworthy and magnificent. Lehi saw that, so he saw the destruction in context of the Big Picture. In verse 8 the angels praise “their God.” Now He is Lehi’s God. concerning the things which he had both seen and heard. Lehi and Nephi considered the things shown by the Lord to be “marvelous.” This adjective doesn’t just describe its noun, but it extends itself into the realm of the verb, describing the effect on the one who beholds it. It is good to have a sense of wonder, to have the capacity to marvel, and not to be so jaded that one can no longer admire. And when we do discover the Lord’s marvelous works, we should want to share that with others. A vision or revelation should be followed by increased discipleship and outreach. What marvelous things has the Lord shown you, or brought into your life? Surely the Book of Mormon itself is a marvel in our lives. Share some information about the marvelous works of the Lord with a friend today! and also the redemption of the world. The Book of Mormon – Another Testament of Jesus Christ – introduces the Lord by His various names and titles, all giving us insight into His character, nature, and work. He is now introduced to us as the Messiah. Although Christians read the Old Testament and find abundant evidence of the future advent of Jesus, apparently these things were as hidden to the people of Jeremiah’s day as they are to the Jews today. It looks like even the fact of a coming Messiah was news to them – unwelcome news. A Messiah was an anointed one. Did they reject this idea for the same reason Herod rejected him – he wanted to be the king, and didn’t need anyone else taking that place? Was this viewed as a political threat? The Messiah is scheduled to come again, and when He does, the world will not be the same. In what ways will the world as you know it change? Are there any changes that you will not welcome? Are you ready to live with the Messiah as King? and they also sought his life, that they might take it away. to make them mighty even unto the power of deliverance. I will show unto you. Nephi has introduced himself and his father, his nation, and God and Jesus. He now introduces one of his major purposes in writing the record – the focus of what he will be writing about, and he wants us to pay attention and recognize the lesson that he is teaching us. Nephi is going to write about deliverance – about God’s tender mercies of deliverance, and how He makes people strong with His power. Be aware of the theme of deliverance throughout the books of Nephi (and actually the rest of the Book of Mormon as well). But Nephi says the Lord makes only certain people mighty so that they can deliver themselves. Which people? Those who have faith – faith makes them the chosen ones. If you want to be chosen by the Lord, and ready to receive his tender mercies, have faith. 1 Nephi 1 is an introduction to the Book of Mormon. But it’s much more significant than introducing Nephi and his family and situation. It’s an introduction to the great God, worshipped and praised by hosts of angels. This is not a God basking in his glory, but One who is aware of all His children, reaching to them through His grace. He is concerned for a whole nation, and He answers the prayer of one man. It’s an introduction to the One who came down from heaven. We’ll read much more about Him later, of course; we only catch a glimpse of Him in this chapter – a cameo appearance. As we read about God throughout this book, this debut appearance should be firmly established in our minds.